Losing weight, strengthening muscles, and increasing flexibility may help you stave off joint replacement. You may be putting off a doctor visit to address knee or hip osteoarthritis because you believe it will end with joint replacement surgery, but that's not always the case. "Exercise and weight loss are actually the first line of defense," says Dr. Eric Berkson, director of the Sports Performance Center at Harvard-affiliated Massachusetts General Hospital. "It may help prevent the pain and prevent surgery." The main component of joint surgery avoidance is strengthening the muscles that support your joints. The quadriceps in the front of the thigh and the hamstrings in the back are key to knee strength. "Every time you walk or run or do anything weight-bearing, the quads absorb the shock. The stronger your quads are, the less load that gets transferred into the joint," says David Nolan, a physical therapist atMassachusetts General Hospital. To build quad strength, you'll start exercising while lying down: tightening your quads with your leg out in front of you, or lying on your stomach and raising your foot into the air to strengthen your hamstrings. You'll progress to standing exercises such as leg lifts and curls, and graduate to exercising on weight machines. 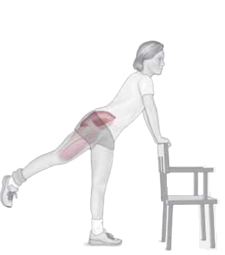 The gluteal muscles in the buttocks and flexors in the pelvis are important for hip strength and flexibility. To beef them up, you'll start with a number of different leg lifts, such as extensions and clamshells, before progressing to exercises on weight machines. Stretching is important to keep the muscles flexible. Nolan recommends doing this after exercising. "Exercising first brings more blood flow to the area and makes the muscle more amenable to change," he explains. You'll see a change in your muscles after four to six weeks of daily exercises. Then you can move to rigorous exercises two to three times a week, but you can never go back to a nonactive lifestyle. "Doing this doesn't restore cartilage. If you stop, you'll go back to the way you felt before," says Nolan. The force you place on your joints can be up to six times your weight, so shedding pounds can reduce that pressure. "If you're 10 pounds overweight, it's 30 to 60 pounds of pressure on every step. Even a 10-pound weight loss can make a huge difference," says Dr. Berkson. But don't jump into a drastic diet plan. You'll have to work with a dietitian to reduce calories but ensure you're getting the baseline of what your body needs to build muscle and keep up your energy. A typical guideline is 130 grams (g) per day of carbohydrates for both men and women, and 56 g of protein per day for men, 46 g of protein per day for women. Chondroitin and glucosamine supplements may help as well, although research has provided mixed results. Chondroitin sulfate helps to keep cartilage from deteriorating. Glucosamine stimulates cartilage formation and repair. Dr. Berkson says they take at least four weeks to be effective, and the supplements don't work for everyone. There's no guarantee that a program of weight loss and muscle strengthening will help everyone avoid joint surgery, either. But both experts say the approach is an important alternative. "I can definitely say I've had a number of patients who've canceled or delayed surgeries by doing this," says Nolan. Once you're strong enough, your PT may suggest strengthening glutes with hip extensions. Stand behind a sturdy chair. Hold the back for balance, bend your trunk forward 45 degrees. Slowly raise your right leg as high as possible without bending your knee. Pause. Slowly lower the leg. Aim for eight to 12 repetitions. Repeat with your left leg. Rest and repeat the sets. Stand with your feet shoulder-width apart. Hold a weight in each hand with your arms at your sides and palms facing inward. Slowly bend your knees about eight inches. Keep your back slightly arched. Pause. to 12 repetitions. Rest and repeat the set.